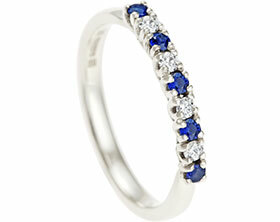 9ct white gold scatter set sapphire eternity ring. This is a 9ct white gold eternity style ring. The ring measures approximately 3.5mm wide and 1.5mm deep all the way round. We have chosen a lovelycombination of 9 1.5mm brilliant cut pink and blue sapphires with 1.5mm H Si quality diamonds. There are a total of 3 diamonds, 3 blue sapphires and 3 pink sapphires in a variety of pink and blue shades.The stones have been randomly scattered and invisibly set all the way round the band creating a subtle sprinkling of colour and sparkle.